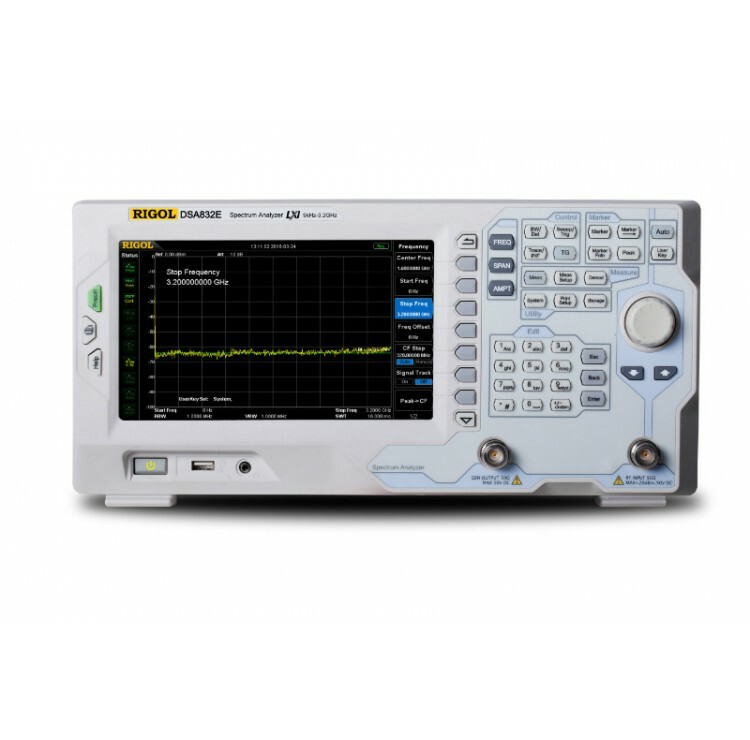 RIGOL DSA832E is the high performance compact size and light weight Spectrum Analyzer. The frequency range is from 9kHz to 3.2GHz and provides tracking generator function with“-TG” model.The digital IF technology guarantees its reliability and performance to meet the most demanding RF applications. The ability to measure smaller signals: on the basis of this technology, the IF filter enables smaller bandwidth settings, which greatly reduce the displayed average noise level. The ability to distinguish between small signals by frequency: using the IF filter with the smallest bandwidth setting, it is possible to make out signals with a frequency difference of only 10 Hz. reference level uncertainty, scale distortion, as well as errors produced in the process of switching between logarithmic and linear display of amplitude when using a traditional analog IF design. Higher reliability: compared with traditional analog designs, the digital IF greatly reduces the complexity of the hardware, the system instability caused by channel aging, and the temperature sensitivity that can contribute to parts failure. High measurement speed: the use of digital IF technology improves the bandwidth precision and selectivity of the filter, minimizing the scanning time and improving the speed of the measurement. Typical (typ. ): characteristic performance, which 80 percent of the measurement results will meet at room temperature (approximately 25°C ). This data is not warranted and does not include the measurement uncertainty. and is measured at room temperature (approximately 25°C ). amplitude drift variation with time. This data is not warranted and is measured at room temperature (approximately 25°C ). specifications (except the TG specifications) listed in this manual are those when the tracking generator is off. Set "Auto SWT" to "Accy"
NOTE:  When f c = 10 MHz, input level > +25 dBm and PA is Off, the protection switch will be on. NOTE:  Except the internal local oscillator (1820 MHz) and its harmonics.